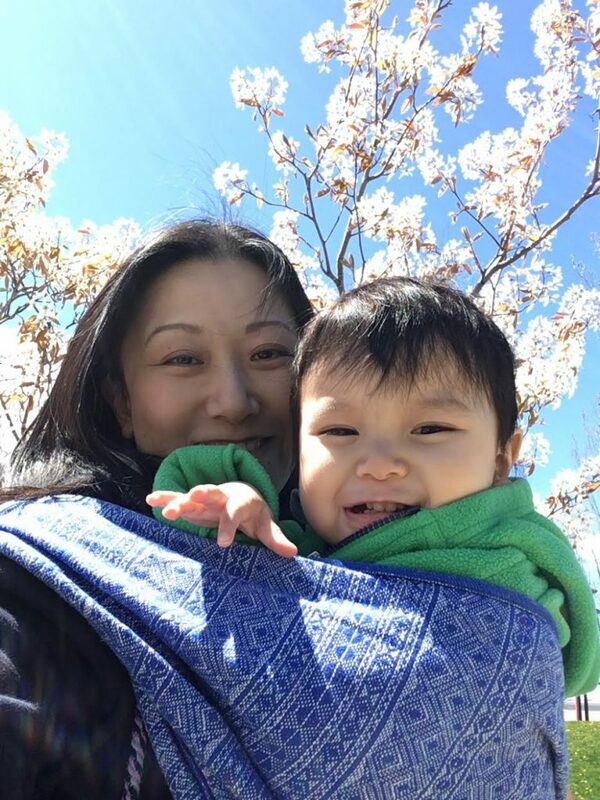 We continue the recognition of Babywearing Education this week by featuring a spotlight on Ada Wang of Strand by Strand! Babywearing education has always been paramount to us at Birdie’s Room. We value and respect the wonderful individuals that selflessly devote their time and energy helping new parents and caregivers learn how to wear their babies and children in carriers. If you know an educator or group that you would like to see featured in our newsletter and blog, email us at thenest@birdiesroom.com! I’m a homeschooling mother of 3 kids 6 years and under. While I wasn’t expecting to be here – I completed my Masters of Divinity in Biblical Studies to be involved with church ministry – I’ve been open to homeschooling even before I had children. Like anything it has its ups and downs, but I love the time that I get to spend with my children. I also love music, and am currently learning to play the ukulele. I can’t wait till my kids can join me in playing! Re-watching TV series on Netflix is another pastime of mine – Bones, Grey’s Anatomy, House, Being Erica. I’d watch a new one but I get so drawn in, nothing else gets done! How did you embark on your Babywearing journey? I started with a Moby with my first baby. I saw a friend use it at church and loved how close baby could be to the parent. It was intimidating to watch her wrap, and then learn it myself! – but the desire to hold my baby son close was my motivation. With my second, I invested in a Britax light structured carrier because I found the Moby uncomfortable when my son was 12 pounds and wanted something that lasted longer. While it helped, I found it bulky and difficult to bring around when not in use. When my daughter started to walk, I realized I would need something that I could use quickly when I took the two kids out together. I tried a Tula and while it was great, it didn’t completely meet my needs. I saw a friend who carried her 2 children, a toddler and infant at the time, in 2 woven wraps at a music festival and found it fantastic that there was something which allowed us parents to do this! I started with a mid-size wrap and was able to use a traditional sling carry for quick trips like crossing a parking lot or paying for something at the store, and use a ruck for her nap times when we were out. 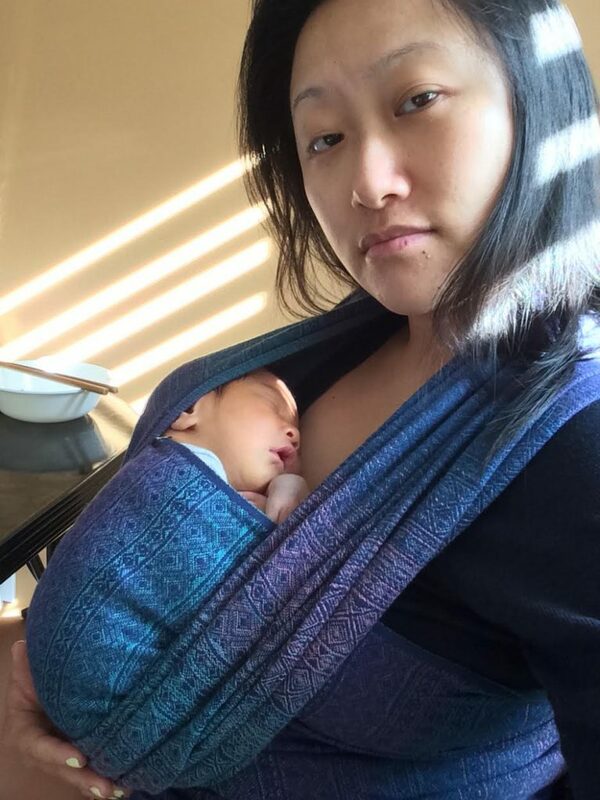 Once my third was born, I was very comfortable using woven wraps and haven’t looked back! How did/has Babywearing let you carry on your everyday life as a parent? I knew that with my 2 energetic older kids, I would need my hands free to play with them, hug them, and generally get things done. I anticipated I would need to do baby’s naps in the wrap regularly to keep the day running smoothly, and I was more than right! My youngest had most naps in a wrap every day till about 6 months old, and thankfully he transitioned well to sleeping in his crib. Those wrap naps saved my sanity as I didn’t have to find a way to occupy my two older kids and I didn’t have a cranky, over-tired baby on my hands. I can’t imagine doing it any other way! Without babywearing, we definitely wouldn’t be considering having another baby. What do you love most about Babywearing? Babywearing calms my anxiety and deflates my stress levels. There are so many things to watch out for as a parent, never mind as a parent of 3 kids. I’m always afraid I will forget something, and there have been times I’ve been late to feed my baby! Thankfully he is a *very* easy-going child, but I was glad to have him so close to me pretty much all the time in those first 6 months so I was never wondering how he was doing. I always knew what was going on, and I was able to attend to my older children as well. Babywearing also gives me freedom. I love that I didn’t have to lug around the infant seat around all the time when we were out, and that I didn’t have to plan around the use of a stroller – I didn’t have to hunt for elevators and ramps anymore! I can go almost anywhere I want to. I did have to pack lighter and more creatively since I would carry the bag instead of use the stroller, but that was a good challenge for a heavy packer like me. Why did you become a Babywearing Educator? I love to share the opportunity for less stress and more calm to other parents and caregivers. I see parents almost everywhere who are trying to calm a tired and frustrated child, which is draining for both adult and child. A nap or a snuggle in a carrier can easily change that, and is much easier than, say, being at IIKEA and holding a toddler in arms while they sleep. Too often parents give up on a carrier because it becomes uncomfortable or it’s too daunting, and almost every time it would only take a simple tweak to make the carrier feel great, or 5 minutes with an educator for a parent to gain confidence in his ability to use a carrier well. 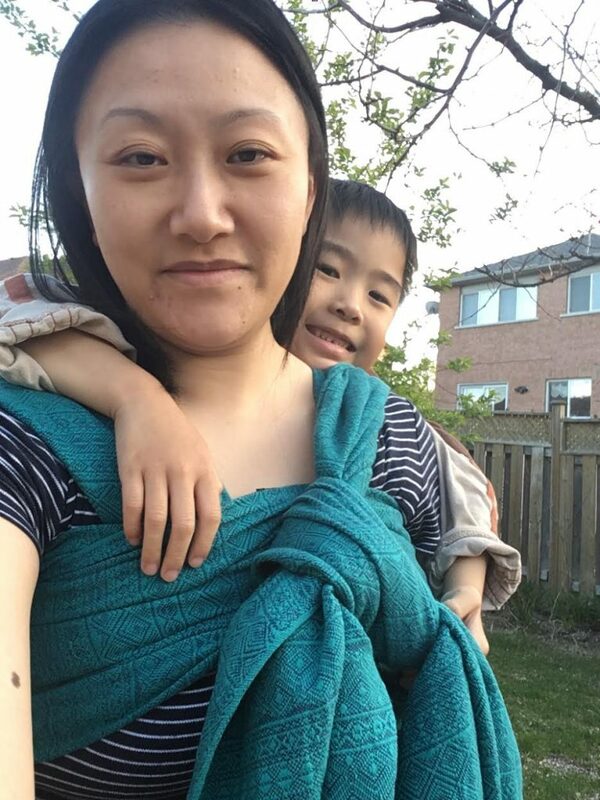 I saw how patient and encouraging the leaders in the Toronto babywearing group, Carry Me Close, were to all the members and I wanted to be part of that, especially in York Region where I live now, and where I am one of a handful of educators. What Groups do you lead and/or volunteer at? I am one of the leaders in the York Region Baby Wearers Facebook group. I became involved when I organized a few meet ups in south York Region, as the 2 current leaders lived up in Newmarket and most of the gatherings happened up there. I also hosted a few meet ups with other woven wrap users before taking the Level 1 course through the Canadian Babywearing School, and joined the YRBW leadership team in February 2017. What made you decide to create Strand by Strand? As wonderful as the meet-ups are, I realized that it was difficult for some parents to come out either due to weather, scheduling conflicts, and/or simply the demands of parenting! I want to meet the parents where they are and help teach them the skills in the comfort of their own home, which would hopefully boost their confidence in using a carrier and in turn, raise their confidence in parenting. Tell us more about Strand by Strand. What is your mission? 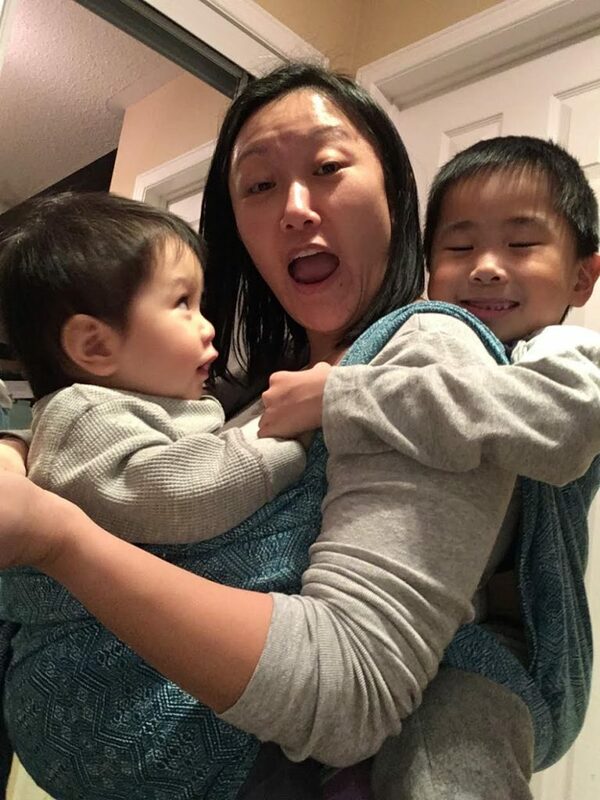 My mission is to help normalize babywearing and for everyone to see that it is a great tool in bringing parents and children closer – not just physically, but emotionally and mentally too. How has Strand by Strand influenced the community? Strand By Strand is still fairly young so it isn’t that well-known yet, but I believe that we are playing an important role in raising awareness about babywearing through the meet ups we have had this year at Treehouse Play Center. Parents using the facilities (i.e. 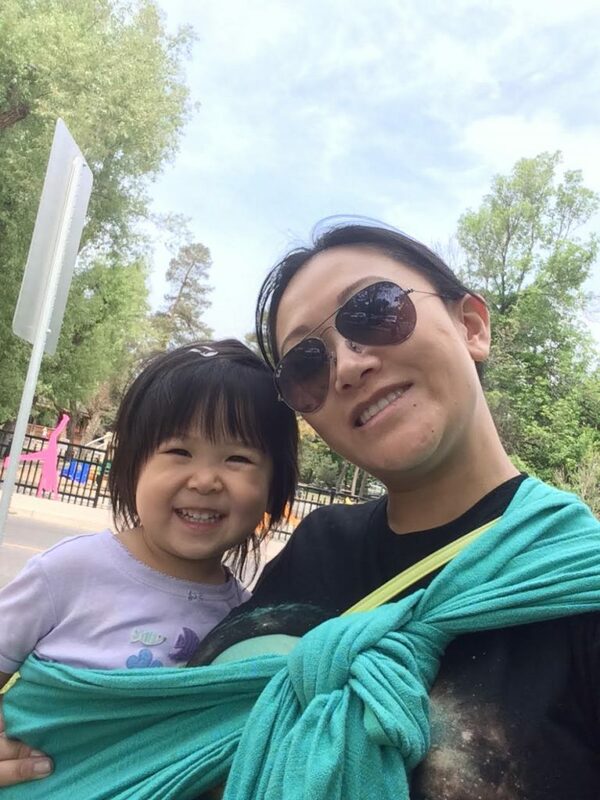 not attending the meet up) are seeing people learning about babywearing and supporting each other, and members see the value in learning about their carrier in-person. 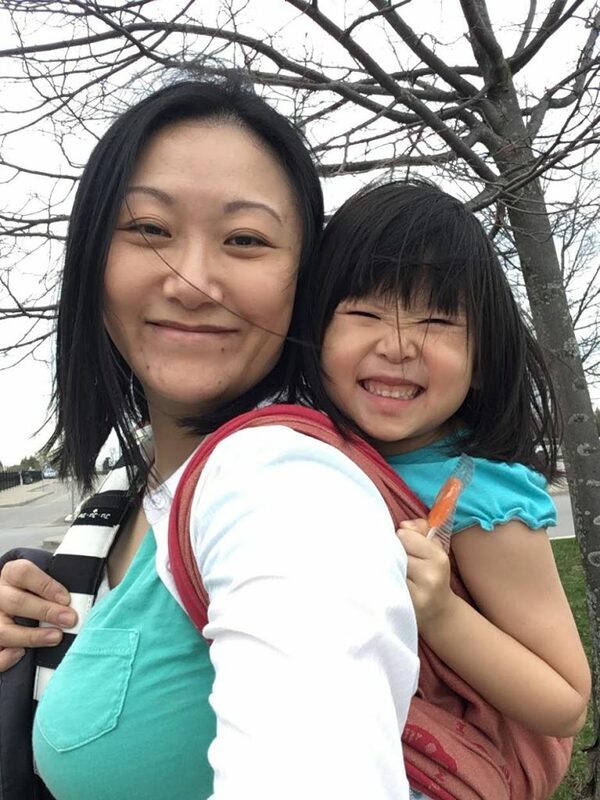 I look forward to seeing more babywearing in Richmond Hill! How has your babywearing journey as a leader, educator and a babywear influenced other areas of your life such as your lifestyle, career etc.? Being an active member in the group has definitely influenced my decision to become an educator and consultant! It helped me discover my passion for increasing the connection between parents and children, and makes use of my love for teaching as well. I love seeing that “Ah-ha!” moment! As for my lifestyle, it has made getting out of the house so much easier. I used to get so overwhelmed with getting the baby ready to go out that sometimes I would simply decide to stay in, especially if I have my older children with me. Wearing my youngest during our routine to go out has cut down on my stress and has enabled me to take more impromptu walks and grocery trips with all of my kids. I know it sounds small, but to me it was a big thing to be able to have a fairly sane time buying groceries! Being able to have less stress (not no stress, but less) when going out with all 3 kids on my own has helped our household accomplish more. What do you love most about teaching babywearing? I love seeing parents watching their child settle into the carrier and relax, meaning the parents start to relax as well. It doesn’t always happen right away, especially if things haven’t gone well up until we’ve met, but when it does, it’s gold. You can see the stress melt away and the anticipation of happier times ahead. I enjoy so much giving parents the hope that parenting can be easier than what they’ve seen so far! How has teaching enhanced your life? Teaching others about babywearing has helped me find a purpose outside of being a mother. While I love teaching my kids and spending time with them, it has been good to know that I can contribute to adults learning as well. I also needed an outlet and a way to connect with adults in a natural way, so teaching has provided me opportunities to meet up with other parents. And having occasional meet ups at my home have forced me to clean more! When a new parent asks why Babywear, how do you explain it to them? Babywearing helps both the baby and the parent. To the parent, a carrier, is like the extra pair of hands you would love to have in another person but may not be able to have, for one reason or another. A carrier helps nap your baby, soothe your baby, and show your baby the world as you go about your life. In some ways it’s better than having another person because the baby has direct access to the caregiver, which helps the parent-child relationship in so many ways. To the baby, especially a newborn and infant, it gives consistency in a world of change that has been thrust upon them. She literally has no clue what’s going on, and being next to her caregiver(s) gives that stability and calm amidst so many new experiences. She is still getting used to being out of the womb, and a carrier helps facilitate that transition during the “fourth trimester”. How do you determine what is the best carrier for people? I ask them what they are intending to do while wearing their child, and how much time and effort are they willing to put in to learn. During our discussion those intentions may change, but understanding their lifestyle and willingness to learn helps whittle down the choices quickly. What are your core teachings to new wearers? Technically speaking, always know the minimum requirements and the maximum capacities of your carrier. Make sure your child is visible and kissable, and that he is seated with his knees higher than his bum. Last but not least, tighten your carrier strand by strand, or buckle by buckle. Aside from the technical aspects, I would remind them that babywearing is a tool, not a magic wand, as much as we talk about “sleepy dust”! It needs to be used properly and done properly so that it can help diffuse a stressful situation and, hopefully, turn a frustrating moment into a much calmer one. Do you have a personal preference for a style of carrier and why? Yes! I love woven wraps. I believe that every carrier has its place in the babywearing world but I love woven wraps for their flexibility and durability. Since I have some issues in my hip joints and lower back, I really appreciate being able to change into a different carry according to how my body is feeling at the moment. I also love that I can go from carrying my toddler to my 6-year-old without hesitation because of the strength of a woven wrap. On top of all that, I love the feeling of the different fabric blends and enjoy discovering their different qualities! 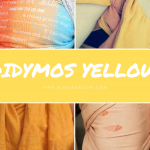 How has Didymos and / or Birdie’s Room assisted in your wearing and teaching experiences? My first opportunity to interact with and see a collection of wraps was at the Birdie’s Room booth at a baby show. Cindy was wonderful in sharing her love for the wraps and let me spend some time taking it all in. 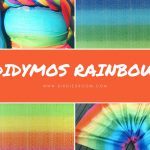 I bought my first wrap there, a size 3 Emerald Turquoise Hemp Prima, and have found a lot of support for babywearing and geekery amongst other Didymos fans. 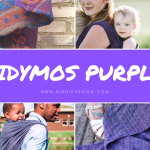 If you could create a dream Didymos wrap, what would it be? That’s a tough question! I have a few ideas in mind, and one of them would be medium-weight, black/gold or charcoal/gold wrap, in the OS pattern, made with either silk or wool. It would be so classy, and I’d hope the shimmer would be fantastic! Any other words of wisdom for a new wearer? Any words of wisdom for the hobbyist babywearer? As many have told me, the babywearing years are short! Enjoy these carriers as much as you can, but also remember to set limits. 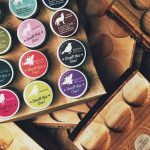 Carriers, as lovely and enchanting they can be due to the wonderful creativity of companies and small businesses, are mainly tools to help us be better parents and impact our families positively. One great way for woven wrap lovers to #tryallthewraps is to join groups where members do temporary exchanges or send their wraps out to visit others. 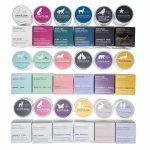 It helps keep costs low and be the possible start of many beautiful friendships!